Subject: Re:The NEW Mierce Miniatures Darklands Ongoing News and Rumors Thread - Rulebooks are shipping now! I wonder when (or if?) it will pass to retailers for sale ? Some of these miniatures look fantastic. Hoping to get some of the 'big bad' things from here that the Infernal Overlords failed KS didn't ever supply..
All I can say is, oh. my. God. The miniatures are just absolutely stupendous, how is this game not at the top of selling lists? Even without the game and rules have already picked out several that are going to be in the painting queue. Subject: Re:The NEW Mierce Miniatures Darklands Ongoing News and Rumors Thread - MIGHTY MONSTERS KS NOW LIVE! Subject: The NEW Mierce Miniatures Darklands Ongoing News and Rumors Thread - MIGHTY MONSTERS KS NOW LIVE! I love good news on a Monday! OK, I'm a sucker for models with two-handed hammers/maces. And I was already in for...just about everything Atalantean too. This one is great, and will make a great companion piece for Original Kretos! I'm afraid they'll get me back again with the crab men. Debating whether or not I need the giant crab lobster thing as well. I take it is this the previous version of the rules, which will be superceded by the new hardbook release? Is there much difference between the versions of the games? They're played with the recent rules. Those crab 'men' are on 80mm bases, standing 70mm high! There's already been mention of...Fish-Men! So, I ask you...can Shark-Men be far behind? I asked for you Highlord - I asked for us all! @Alpharius - yes, shark-men and whale-men are on the table. Anything semiaquatic is, and if we ever do Darkseas... who knows? Gah! I really want to get into the New Kindreds but they keep releasing stuff for the older kindreds. What's the going rate for souls these days? What's this? Two Infernii monsters? 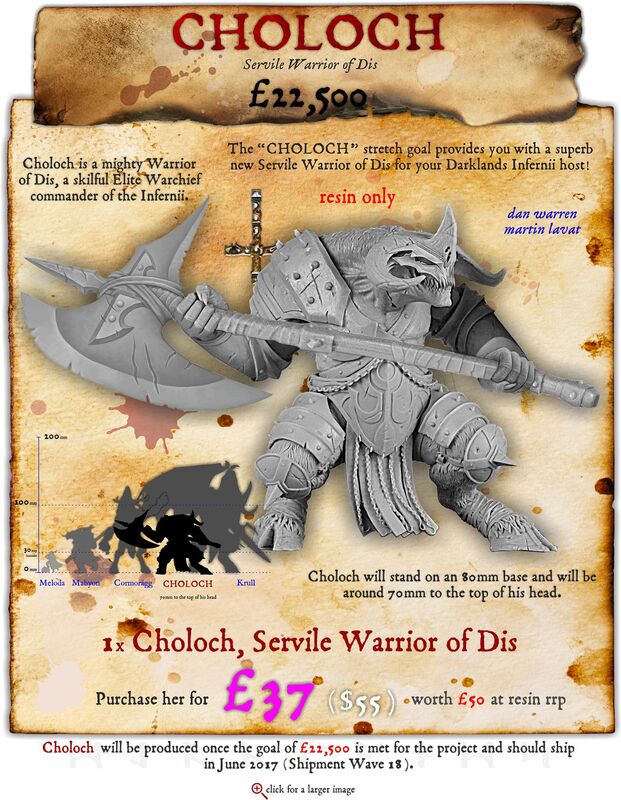 Well, why not... so here's Choloch, a mighty Servile Warrior of Dis, set at £22,500 to unlock! Choloch is based upon the awesome Malacant and is an Elite Warchief of the Infernii, able to lead whole armies of demons of Infernus and, of course, their mortal allies the Byzantii! Increase your pledge by £37 to purchase Choloch, who will only be produced in resin. Choloch is a SMALL MONSTER and so can also be included as a monster within in the FIVE MIGHTY MONSTERS reward! Watch out for more MIGHTY MONSTERS soon! That's a big axe. Compensating for something...? Or.. you never know, you could try a new game that uses these beautiful minis to their full extent? Well considering that the Mierce miniatures show the anatomical organs, especially the Infernii, you could check if he actually is. The graphic says "purchase her" but I can confirm Krull is adequately equipped! Hopefully when everything gets organised and not so...chaotic the game can finally take hold. It says him in the size description. Maybe it's a Slaaneshi demon with both sets of organs. All these demons and the giant skeleton are making this one hard for me to stay out of. I don't think my wallet can handle it. Covered in the last thread - no point going over it again. if a dolphin will jump out of water for fish, just imagine what it would do for chips? Got my first edition book in the mail today! Woot! Got the rulebook and....well, for first impressions, this is the best-illustrated VCR repair manual I've ever read. "The 75mm gun is firing. The 37mm gun is firing, but is traversed round the wrong way. The Browning is jammed. I am saying "Driver, advance." and the driver, who can't hear me, is reversing. And as I look over the top of the turret and see twelve enemy tanks fifty yards away, someone hands me a cheese sandwich." They sent you a vcr repair manual by mistake? ? I can't think of any other document I've read that refers me to "section 6.34.1.2.1", or where the summary of a fairly common action (fleeing) has seventeen steps, all in very precise, very dry computer programming language. Maybe if I read a quickstart or light version it'd help, but right now, this seems like the clunkiest (as distinct from "most complex") system released this decade.